As I have said before, I have never been a big “Shakespeare person.” On top of that; anyone who knows me knows I enjoy a good comedy or musical over a drama any day. It’s from this starting point that I went to review The Richmond Shakespeare Festival’s Othello. Now one thing I have not mentioned in this blog before is that for the past seven years I have performed in a Murder Mystery Dinner Theater. In viewing Othello as a bit of a murder mystery (after all, we know it’s Shakespeare; everyone’s gonna die! ), I was able to psyche myself up for the performance. Once the show started I realized I did not need to work myself up to enjoy the show — the talent of the actors took care of that for me! House Manager Noah Downs started the evening off with a funny bit of business; followed by Kevin Grantz (the Duke) who gave some equally humorous modern “opening announcements à la Shakespeare.” (In the name of full disclosure, I must mention, much to Mr. Grantz’ chagrin, that I have worked with Mr. Grantz during those said seven years of Murder Mystery and never knew he was such a talented dramatic actor). The rest of the cast was equally strong. 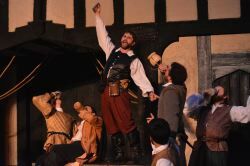 Since starting these reviews in October, I have come to learn that Ryan Bechard (Iago) is one of those actors you could run into at the grocery store…and he’d be great in it! 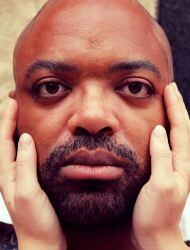 Bechard seems effortless as the duplicitous right hand man to powerful, esteemed General Othello. Bechard’s Iago is charming and debonair in the presence of the other characters one moment; then like a flip of a switch, with a slight turn of his head, a bit of a smirk and a squint of his eyes the evil side comes out in deliciously deceitful asides to the audience. As he makes eye contact with members of the audience, you feel you are almost looking into the eyes of the devil himself. It is Iago who gains the trust of all the others, finds their weaknesses, and then manipulates their feelings of love and jealousy into doing his bidding. He initiates havoc, then sits back and watches the results; all because he was once denied a promotion (I think I may have worked with his twin once or twice!). 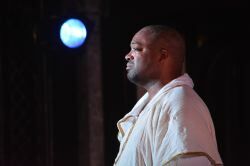 Stephen Seals embodies the bigger than life General Othello; with his booming voice and grand stage presence. Laura Maughan is appropriately sweet and soft-spoken as his wife Desdemona. Two of the most impressive performances for me came from supporting roles. Rebecca Anne Muhleman turned in a leading lady quality performance in the supporting role of Desdemona’s maid and Iago’s wife, Emilia. Muhleman’s heartfelt emotional turmoil in being torn between her love for her abusive husband and her loyal friend are palatable. One of my theater companions, Katie, felt equally as strong about Matt Bloch’s performance as Cassio, and I agree. He was probably the most relatable character in portraying Cassio’s innocence and naiveté. His natural acting style and comfort on stage made his performance memorable. Margarette Joyner’s costumes were classy (and hot for such a summer night) and helped establish character’s motives with whites for “good” and dark colors for evil. The biggest obstacle for me came in a sword fight. With the audience sitting so close, and the stage so small, it became almost comical rather than realistic. There were also some minor issues with props (especially coins) and boots falling down, but these are easily fixed with time and practice. Again, as one who would not generally choose a Shakespearean play for entertainment, I can strongly encourage you to go see Othello. The strong performances result in general great entertainment! Disclaimer: Richmond Shakespeare Festival provided two complimentary media tickets to ShowBizRadio for this review. This article can be linked to as: http://showbizradio.com/go/9600.